Word is Fade Street Social is the hippest joint in town so it demanded my attention on a recent Sunday evening before Christmas. We thought, heading in, that it would be quiet enough given it was Sunday and presumed everyone would be at home recovering from their 12 pubs and washing their novelty Christmas jumpers. Not so. It was packed to the rafters at 9pm and we were lucky to just about get a place in the gastro bar ordering from the tapas menu. Dylan McGrath’s done good. What an incredible interior! I had a little peek at the main restaurant and I definitely want to eat in that room someday, the menu sounds great too. I also nipped upstairs to the bar area, another gorgeous space but, personally, not somewhere I’d like to spend my precious boozing time. Back to the food. We were sitting at the counter in the gastro bar where we could watch the chefs at work. It was quite exciting and meant we could see what dishes were being served and which ones took our fancy. That didn’t make choosing any easier, they all looked incredibly delicious. Eventually we decided on six different tapas to share. Skate Wing, €10, Wild Irish Mushrooms in Celeriac and Cep Dressing, €5.95, Lobster Hotdog, €9.95, Truffle Pasta w/Charred Artichokes and Parmesan, €8. 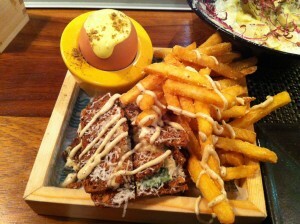 Soft Shell Crab, €9, and Baby Crab Toasties w/Hollandaise and Skinny Fries, €6.50. 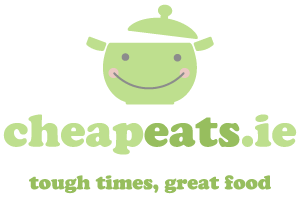 Really good food with an unusual twist, what we got was fantastic. The truffle pasta was death row-last meal kind of stuff, insanely good. The only things that didn’t really stand out for us were the skate wing and lobster hotdog. The desserts were okay, I had Banoffee, €7, which included caramel jelly and banana sorbet instead of the traditional ingredients. I understand this is a creative take on an average dessert and perhaps my palette is a bit unrefined but I just didn’t enjoy it. Jim had a Neopolitan Sandwich, €5, and was happy enough but we both wished we’d ordered more from the savoury end of the menu instead. The atmosphere in Fade Street Social is very relaxed, and it was a pleasure to sit and watch the buzzing kitchen in action. We didn’t feel in any way rushed but I think that is because we arrived so late in the evening and the place started to quieten down, albeit only marginally, halfway through our meal. I’ve heard from others who went earlier that you’re under pressure to finish up. Like every other restaurant in this town, they’re eager to cram in as many sittings as possible. The wait staff got the job done but the service was nothing to gush about – it felt a little cold. It’s not a cheap eat, in fact, I was surprised at how expensive it turned out to be, including two glasses of very nice NZ Pinot Noir and two Pilsners our bill came to a total of €92.20, excluding service. Although I am sure you could eat and drink here for much less, we did go for choices like crab and lobster after all! I think Fade Street Social deserves to be as busy as it is. It’s a really lovely, interesting space serving up innovative and yummy food. I’m looking forward to returning, to both the restaurant and the gastro bar. Spot on on the service. Very cold i thought. When we were there (a bunch of 10 people), the staff got really antsy when we were slow to vacate the table. I handed my ticket to a waiter to get my coat, he came back with it and I gave him another one that a friend had mislaid, and he said: ‘oh, doing them one by one are we?’ (very sarcastically). Grr…. I was there a couple of weeks after it opened and loved it. We ate upstairs as downstairs was fully booked.The staff could not have been nicer and the food was delicious. Our bill with lotsa good house wine came to 40 euros each and we thought it was worth every penny. It is top of my 2013 ‘to do’ list to eat at the restaurant !! I’m going to blame the weather and the first day back at work blues but the restaurant menu annoyed me. First, charging a fiver for bread and butter is outrageous, second, don’t call it blossom and charge the same price as salmon when it’s really pollack finally, banoffee is spelled incorrectly.